Obverse – Portrait head, laureate, on globe right, dotted border. 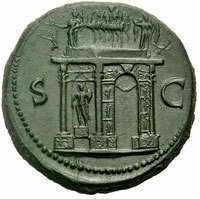 Legend – NERO CLAVD CAESAR AVG GER P M TR P IMP P P.
Reverse – S-C. Triumphal arch of Nero (Arcus Neronis), front and left hand sides are shown. The single archway springs from two Ionic columns with more columns adorning each corner. A quadriga, driven by Nero, between Victoria and Pax and flanked by two soldiers, surmounts the arch; on the side is a pediment niche containing a statue of Mars. At the corners of the entablature are small statues and the front is decorated with reliefs, of which only the flying Victories on the spandrels are identifiable. RIC 392; C. 307; BMC 329; CBN 77. 27.98g. Dark green patina, extremely fine with a wonderful portrait and a splendid reverse. The arch commemorates Corbulo’s victories against the Parthians and was errected between 58 and 62 on the Capitoline hill. It was probably overthrown after Nero’s death in AD 68. The sestertius, or sesterce, was an ancient Roman Empire coin. About 23 BC, during the coinage reform of Augustus, the denomination of sestertius was introduced as the largest brass denomination. The sestertius continued to be produced as the largest brass denomination until the late third century AD. Most were struck in the mint of Rome but from AD 64 during the reign of Nero (AD54 to 68) and Vespasian (AD69 to 79), the mint of Lyon (Lugdunum), supplemented production. Lyon sestertii can be recognised by a small globe or legend stop, beneath the bust. During the Roman Republic it was a small, silver coin issued only on rare occasions. During the Roman Empire it was a large brass coin. The name sestertius (originally semis-tertius) means 2, the coin’s original value in asses and is a combination of semis (half) and tertius (third), that is "the third half" (0 being the first half and 1 the second half) or "half the third" (two units plus half the third unit, or halfway between the second unit and the third). Born Lucius Domitius Ahenobarbus, also called Nero Claudius Caesar Drusus Germanicus, Nero was the fifth and last Roman emperor of the Julio-Claudian dynasty. Nero was adopted by his great uncle Claudius to become heir to the throne. As Nero Claudius Caesar Augustus Germanicus, he succeeded to the throne on 13 October 54, following Claudius’s death. Nero ruled from 54 to 68, focusing much of his attention on diplomacy, trade, and increasing the cultural capital of the empire. He ordered the building of theaters and promoted athletic games. His reign included a successful war and negotiated peace with the Parthian Empire (58 to 63), the suppression of the British revolt (60 to 61) and improving relations with Greece. The First Roman-Jewish War (66 to 70) started during Nero’s reign. 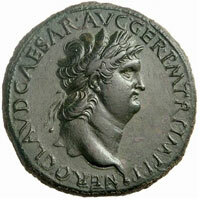 In 68 AD a military coup drove Nero from the throne and facing certain assassination he committed suicide on 9 June 68 AD.